Athlone Film Club continues its winter season with the award-winning French dramatic film , Love (Amour ), on Tuesday November 26 at 8pm in the Dean Crowe Theatre. 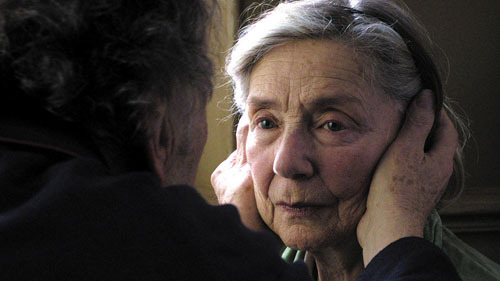 Winner of the Palme d’Or at the Cannes Film Festival 2012 and the Oscar for Best Foreign Film 2013, Amour is a film not to be missed. Hailed as a masterpiece, Love illustrates the taboo issue of old age and dementia in a powerful and unforgettable film. Georges and Anna are a couple in their eighties who have been in a close loving relationship for most of their lives, but old age catches up with Anna and the nature of their relationship changes. As one expects from director Michael Haneke, it is a sober, rigorous piece, and a magnificent collaboration with two veteran actors, Emmanuelle Riva and Jean-Louis Trintignant. The pair give the performances of a lifetime, in that no other roles could possibly require them so directly to work with their own mortality and physical fragility. They rise formidably to the challenge. Haneke’s absolute control makes the film intensely involving and quietly moving, rather than harrowing. Viewers will get an intensely rewarding masterpiece about a topic that ultimately concerns everyone. Come along from 7.30pm for a pre-screening complimentary glass of wine in the theatre bar. Membership of the club is only €10. For more information email [email protected] . Nathan Carter brings his Wagon Wheel to Athlone!